September 22, 2014 by Josh Haynam	in tutorials. Non-profits have a tough job, they bring awareness to some of the most pressing issues our world is facing, yet they are almost always under-funded. At Interact, we’ve been fortunate enough to work with some amazing not-for-profit companies to help bring attention to their causes. Today I’d like to share some tips for non-profits looking to get attention on social media using quizzes. When coming up with a quiz idea, focus on the core issues your non-profit addresses. Sometimes this is easy, if you focus on only one thing, but other times it’s difficult if your group deals with a variety of things around the world. Let’s looks at a couple of examples to help clarify. 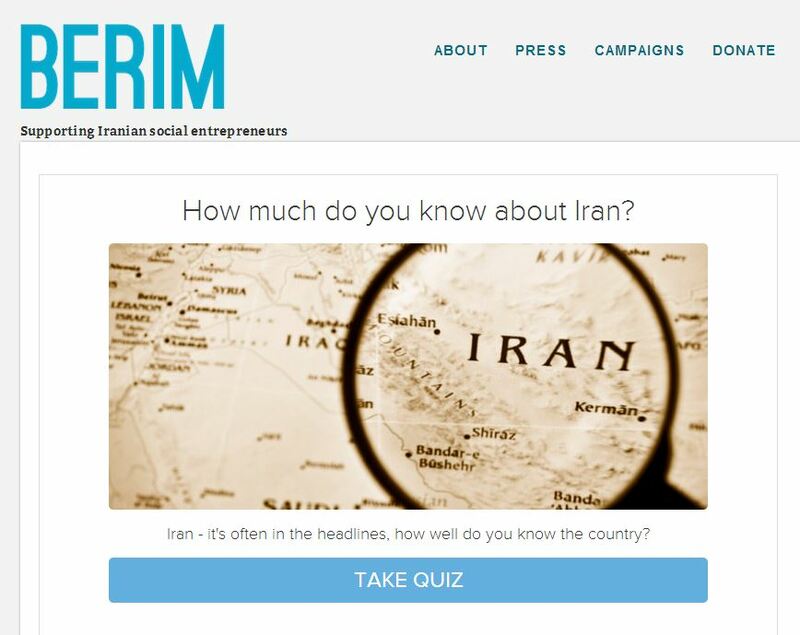 The first comes from Berim.org, a site dedicated to helping social entrepreneurs in Iran. 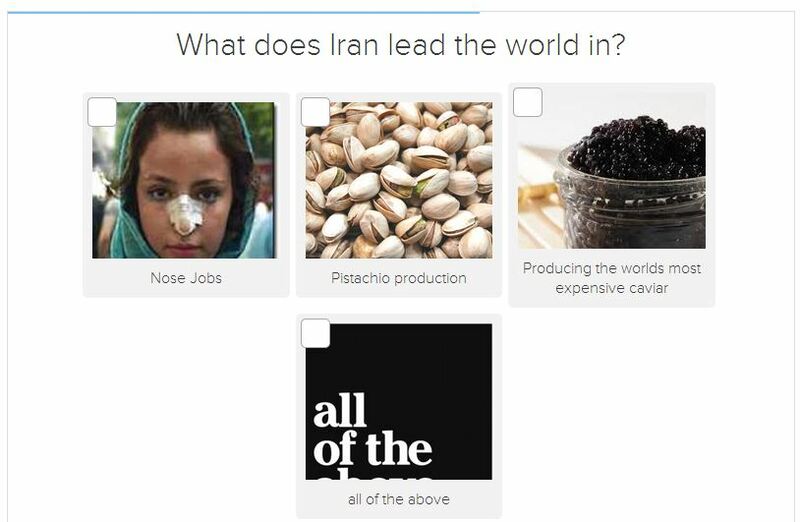 Their quiz is titled “How much do you know about Iran?” and was a pretty simple choice given their main focus is that country. However, they took a unique strategy with this concept because even though their non-profit focuses solely on one country, that country is often misunderstood by the world population. The quiz is very eye-opening and many people remarked on twitter that they were surprised by how little they knew about the country that is the topic of so much discussion. This quiz concept works very well if your group works on an issue that is either not very well known or just plain misinterpreted in the public eye. Moving to the complete opposite side of the spectrum, let’s take a look at an example from Amnesty International, an organization that takes on a myriad of global social issues. They created a quiz “Which social justice advocate are you?” that is a personality type quiz in which each quiz taker is paired up with a well-known (or obscure) global advocate. The concept here is to pick a few of those most prominent areas that Amnesty is working on and highlight them with a quiz. With a group like Amnesty, it’s easy to become overwhelmed by the shear number of ideas to choose from for a quiz, so they stuck with the most pressing ones for the quiz. Headlines make a massive difference for quizzes because the title is often all that gets shared on social media (which is responsible for 75% of quiz traffic). Based on crunching numbers from 2500 Interact quizzes, two title templates have stood far above the rest. 1. “How much do you actually know about?” for example “How much do you actually know about North Korea?” this title is a multiple choice template that challenges your readers to find out if they really know as much as they think they know. Quiz titles with the word “actually” in them get twice as much traffic on average. 2. 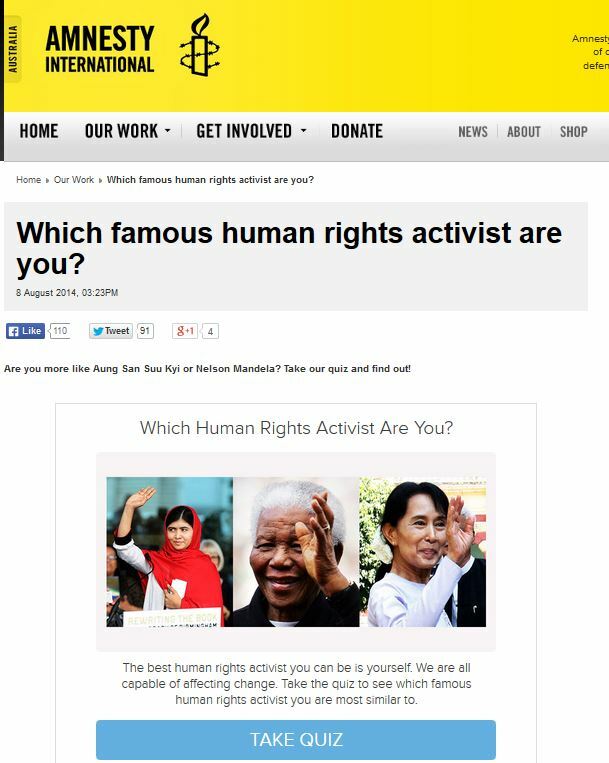 “Which (blank) are you?” for example “Which social justice advocate are you?” This one plays to our natural narcissism. We just like hearing about ourselves, it’s only natural to have a quiz that tells people about themselves. No other form of content can compare to the questions of a quiz. This is where you get an opportunity to talk with each web visitor individually, even if millions of people take your quiz. This is valuable time in which you can build rapport with people who may eventually become volunteers or donate. When writing quiz questions, remember to keep it light. Let your personality and quirkiness shine through and speak like a normal human. We ran a test and found that the best quizzes use a lot of personal language, like “I” “you” and “we” these are words we use a lot when talking to friends, so if you keep your writing style similar to the way you actually talk, the quiz will benefit. As far as logistics go, we’ve found that somewhere between 6 and 15 questions work best. Less than that and you don’t have enough time for conversation, more than that and people will get bored and move on. Also, it’s best to have at least a few image questions, and it’s optimal to have a mixture of text and image questions. Quiz results should be made 85% to put a smile on people’s faces, 10% to educate, and 5% to sell. Your primary goal with a quiz is to reach people on social media, and the things that get shared on social media are the things that make us smile. Think about this, when people read the results of your quiz, they are being given an assessment based on some rather personal opinions and answers to your questions. If there is ever a time when readers want to know more, it’s in the results of a quiz. 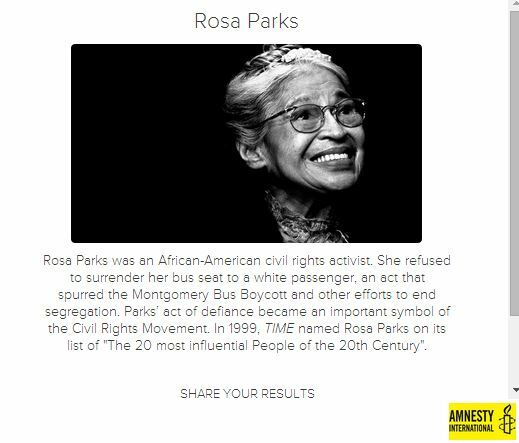 That’s why it’s so important to provide personalized links to each quiz result. These links can lead to contact forms for following up, or to more content based on the particular result, but the important thing is to have them. 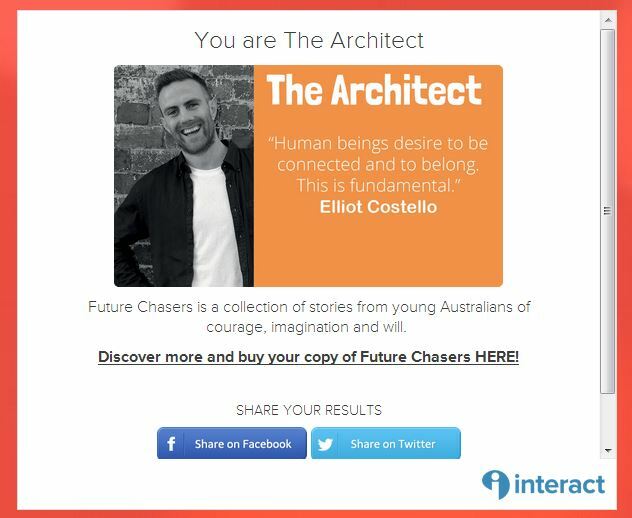 One of the biggest benefits to using quizzes in your content is the personalization they provide. Quizzes provide a way for you to continue conversations with interested visitors in a pointed way. Interact loves working with non-profits and offers a 50% discount to any registered not-for-profit entity. Email sales@tryinteract.com to get that deal.